Something’s not right with the above parameters on ma bike. 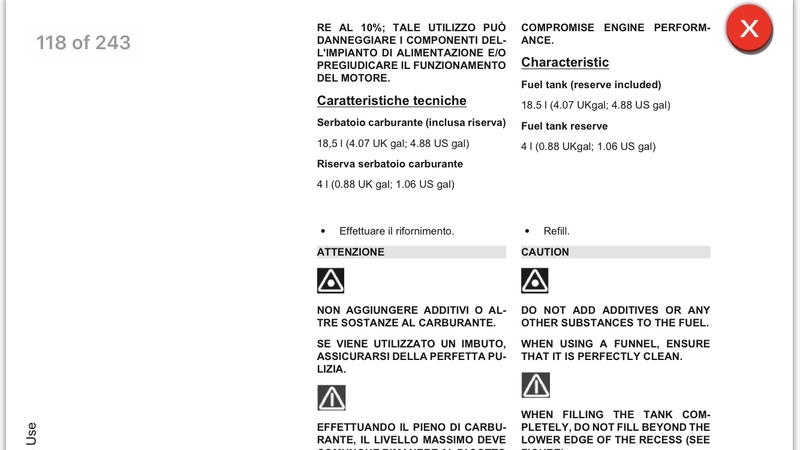 Manual says fuel tank capacity is 18.5L. My usual fuel consumption is between 6.5-7.5L. Worst case scenario range should be 246 km. However I usually get the warning light at 150-170km and people up here said they’d run out of fuel @30 km’s after the warning light came on. Therefore, whenever the light comes on I go and find a gas station. Most fuel I’ve ever pumped was 13L though. So I’m quite confused. I hate going to gas stations, would like to go when really necessary, also don’t want to run out of fuel just to test this out. Anyone else tried running it dry with similar fuel consumption data? Tell me please how many km’s You were able to run on 1 full tank on even roads. I also understand, that due to temperature differences You might not be able to pump the 18.5L fully into the tank, but 0.5L difference doesn’t seem to be within the normal range. So OK, 18L total should mean 240km’s for me (150 miles) with 7.5L consumption. Birky 18.2 very close to the 18.5 spec so I guess it was upright possibly you were sat on it and it was brimmed as close to the filler neck as you dare? Heppy 15.9 possibly on side stand and filled to a conservative level. Forgot to say, mine was the 2012 model. No way would you get 150 miles out of a tank no matter how you ride. The light would come on at around 100 miles and the worst I had on reserve was 10 miles, at best 25 both run to empty. Got the 2016 factory now and run out at 130 miles. Nope, it was to the brim, to the point it came out of the breather. I have the ‘17 Factory, which should have the same dimensions as Birky’s in terms of fuel. HS has a point with the side stand, but Birky said 18.02 not 18.2. 0.5L is not close imho. 2012 had a smaller tank 17l Iirc. which makes some sense in what you said 15.9l to fill up. I concur that once the warning comes the best you have is around 30km more. Had two times the issue so I look for gas as soon as I get the warning. Second time was close to station and a downhill road so went down in N. Fired up once and went into the gas. The average consumption is mostly around 7’s low 8’s not much city riding, sporty hills, 1000m to 2000m mountains winding roads. 23.6 on reserve with a gentle right hand. Tuoldo Fuel Level Warning Light..